I like to joke that February is a terrible month for my husband, Holden– my birthday falls on the 4th, Valentine’s Day is on the 14th, then our anniversary is just a week later on the 22nd. (In my defense, I had wanted to get married a few months earlier, but Holden wanted a long engagement). Last year, we were taking care of last minute wedding details and burnt out from dealing with drama, so Valentine’s Day fell to the wayside. It’s been such an incredibly busy year, especially in these last few months, that I wanted to make sure we celebrated properly this time around. 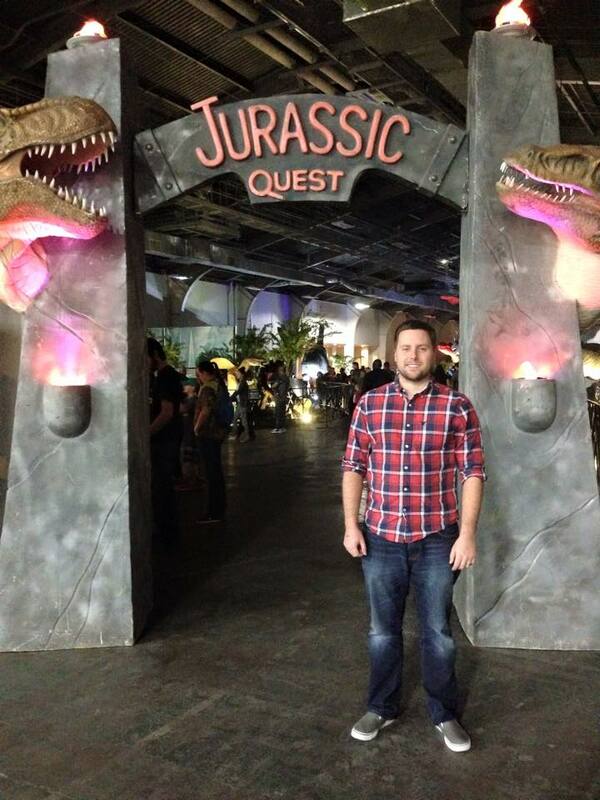 When Sevi told me about Jurassic Quest, I knew that it would be the perfect Valentine’s Day outing for Holden. For those of you who haven’t met my husband, he was nicknamed “Raptor” by coworkers for his obsession with dinosaurs and Jurassic Park. We even danced to the movie theme song at the end of our wedding. Jurassic Quest was definitely worth the trip to Fair Park. They had an impressive selection of animatronic dinosaurs, and lots of activities for families with kids. Although we were too old to ride the dinosaurs, I did get a personal tour from my dinosaur connoisseur husband. Learned lots of fun prehistoric facts! We ended up going through the exhibition fairly quickly, and soon moved to the next stop — lunch at Del Frisco’s Grille! Holden planned the next portion of our date and brought me to one of his favorite Dallas restaurants. We both ordered burgers with parmesan fries and proceeded to pig out. By the time the waiter came by to ask us if we’d like dessert, I couldn’t imagine eating another bite. Holden, on the other hand, had other ideas. I come to find out that Holden’s ulterior motives in bringing me to Del Frisco’s Grille was so that he could order the Nutella bread pudding he had discovered while brunching there with a friend. Holden is notorious for not sharing dessert with anyone… and I knew it was a special occasion when he offered to split it with me! True love. Between the two of us, we cleaned that plate almost instantaneously. After the huge meal and maneuvering through Dallas traffic on the way home, we ended up napping/Netflix-ing for the rest of the day. When we finally woke up in the evening, we decided to have an upside-down dinner at IHOP! Even though the whole day was amazing and a perfect example of why Holden is a wonderful husband, it wasn’t until later that night that I had a moment that solidified how lucky I am to be his wife. We stopped at CVS on our way home from IHOP for a few random items, including a new round brush for my hair. I went to try curling my hair with the new brush and it ended up getting stuck at the crown of my head. My scalp was in searing pain, and I had a complete panic attack trying to untangle the mess without pulling out my hair from the roots. Holden stood in the bathroom with me for what seemed like forever, cutting each prong of the brush and combing through the matted nest until I was finally free. It may be one of the least romantic ways to end Valentine’s Day, but it made me feel more loved than any gift or date ever could. I’m one lucky Mrs. Raptor. Next What is a Digital Perm? Awwww oh my word every part of that is adorable. Sounds like a great Valentine’s Day to me! Hehe! It was a little unconventional, but definitely one for the books. Happy anniversary–and belated birthday! That does,sound like a lovely and loving Valentine’s. My wife’s b-day is the 16th, so mid-month is always a busy time for us.